50% discount until April 30th! Buy your copy now! ”A great book that probably is a goldmine for modern thinking gun dog trainers” 5 out of 5 dumbbells by Swedish dog magazine “The Working Dog”. Get training tips in our blog! Welcome to Retrieving for All Occasions! 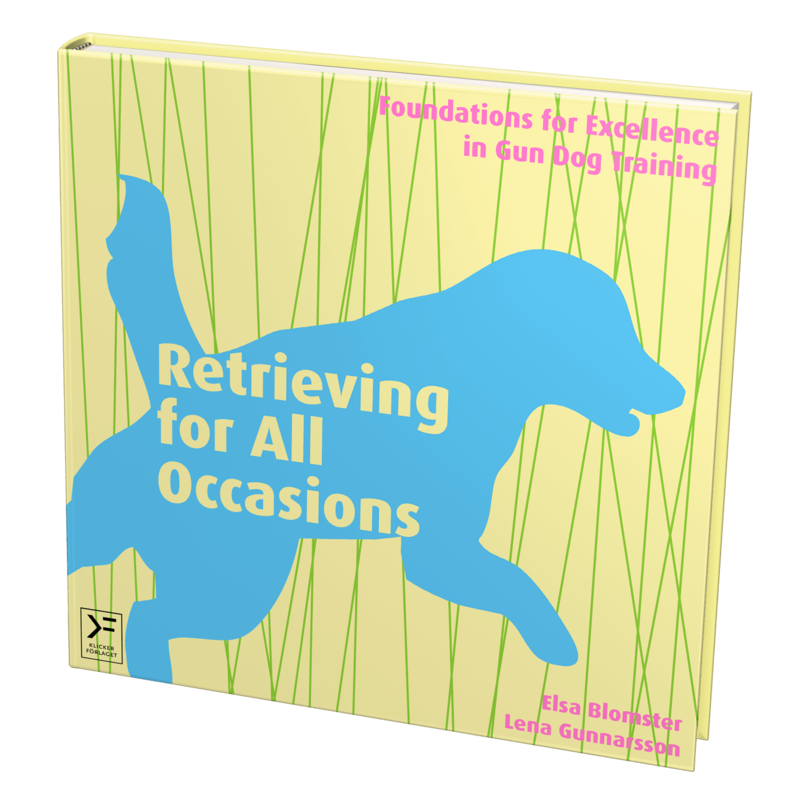 Retrieving for All Occasions is our book where we write about retrieving training for gun dogs and clicker training. 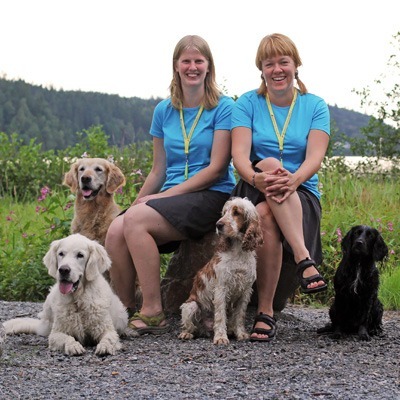 On our webpage you can read more about the book, gun dog training with clicker and follow our blog where we write about the training with our dogs. 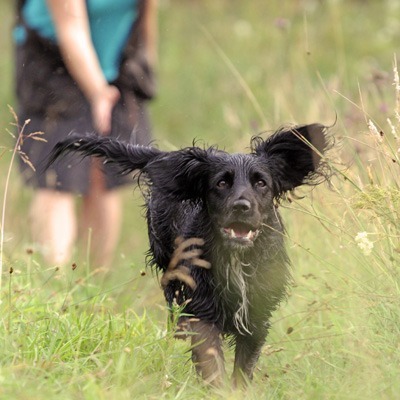 If you want a quick introduction to gun dog retrieving, read the page called Gun Dog Retrieving – there you will find explanations, videos and pictures of all parts of the retriever and spaniel work. Curious? Read more about the book below, follow our blog, watch our videos, like us on Facebook or subscribe to our newsletter. Sign up for our online courses! Can’t attend our courses IRL? Sign up for one of our online courses instead! We give classes in gun dog training; foundation classes, intermediate classes and special classes with focus on for example heelwork and the stop whistle. In our blog you’ll find training tips with photos and videos. You’ll also find information about what’s going on, for example new classes or special offers. 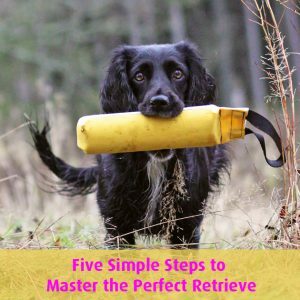 Retrieving exercises are fun to do with your dog. Our focus is mostly on retrieving for gun dogs, but other breeds often enjoy many of the different retrieving exercises too. Who wouldn’t want a dog who could find the lost car keys in the woods after a walk, retrieve them and place them in their owner’s hand? 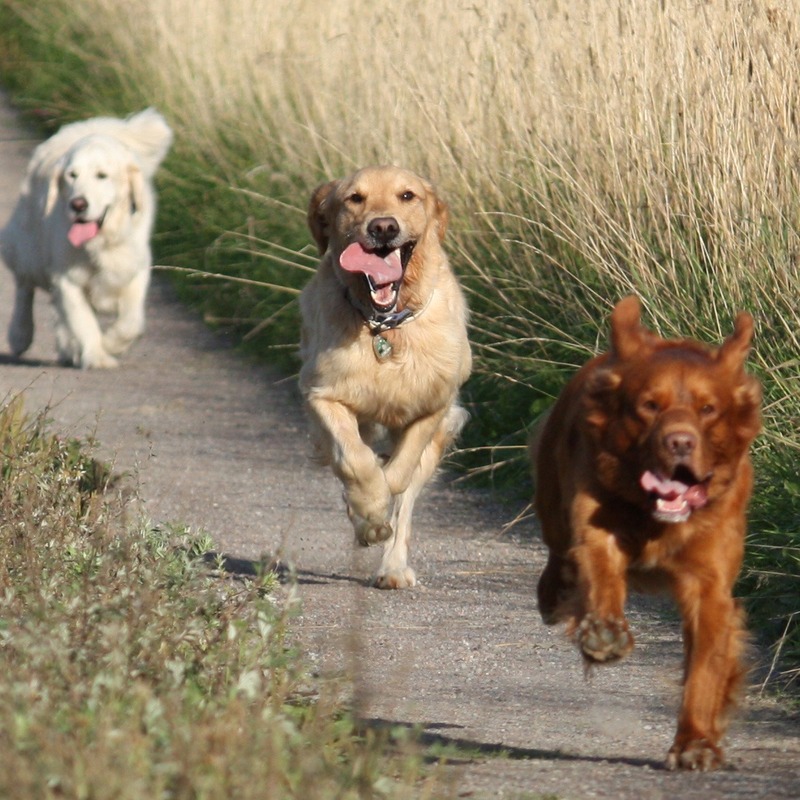 Regardless of whether you want to use the retrieve for fun and to do something with your dog or if you’re aiming to enter a field trial, we hope that you’ll find useful information here. 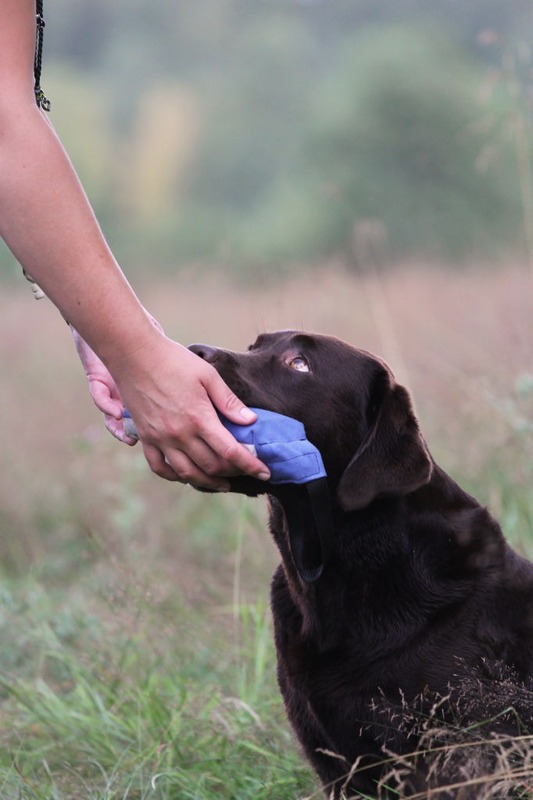 Since gun dogs for a long time have been bred to carry and retrieve objects, they have a predisposition to do just that – which we make use of in the training by using and encouraging their innate behaviors. With dogs that don’t find retrieving second nature, we work a great deal on finding rewards that make it possible for them too to find it worthwhile to retrieve the objects we’ve thrown for them. When reading what we’ve written, you’ll find that we believe that dog training should be fun – for dog and trainer alike. That’s why we’ve chosen to use play as the foundation of our training of the retrieve. When teaching the dog to retrieve we always begin by playing with the dog, because through the act of playing we get so much for free: The dog grabs the toy and gets to win the toy when the grab is distinct (taking). The dog holds on to the toy while we try to distract her by throwing treats (holding). The dog delivers the toy to us and immediately gets it back as a reward (delivery to hand), and so on. We teach the dog that it always pays off to retrieve things so that the she, as soon as she finds something in her mouth, ”thinks” that she has to bring it straight to us. We believe that the most important foundation skills for a retrieving dog are delivery to hand, steadiness and walking at heel. If those foundation skills are in place, and if the dog has a true interest in objects that makes her really want to find the dummies, we have a head start in our training. (For spaniels steadiness includes the dog stopping after the flush; in other words when the dog has flushed the game, she should remain in place.) If we want to make it even further in our training, we naturally need more: a stop whistle, casting (so that we can direct the dog where we want her to go on blind retrieves), calmness and steadiness during gunfire (so that the dog doesn’t get frightened by gun shots), marking ability (so that the dog learns to pay attention to where the dummies fall in order to be able to retrieve them later), a hunting pattern and hunting desire, as well as love for water. 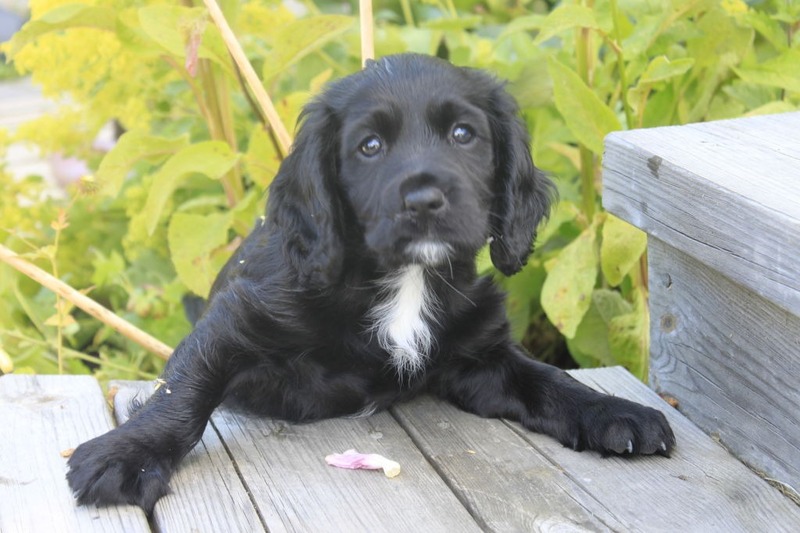 We begin working on the retrieve with the puppy as soon as she’s arrived with us. Naturally, the training sessions are short and simple in the beginning – always adapted to the puppy’s level of maturity and experience. By starting out early with training the retrieve, we lay a solid foundation for the future – the puppy learns that training with us is fun and she learns valuable lessons about the retrieve such as deliveries, the recall and walking at heel gun dog-style. Make sure that you train the retrieve in short and fun sessions and you’ll soon have a dog that loves to retrieve! Clicker training means that we always focus on the correct behavior. We click and reward the dog for everything she does that is good, and the result is that the dog will do even more good things that we can reward. This is called positive reinforcement. Think about mathematics – positive means plus, we add something. In this case, we add something that is nice, something that the dog wants, for example, we say, ”sit” and the dog sits and gets a tidbit. Sometimes the dog doesn’t do exactly what we want, but then we have a plan. We simply prevent the dog from getting the reward. That is called negative punishment. Think about mathematics again – negative means minus, we take something away from the dog. If the dog gets it wrong we simply remove the reward – which is a kind of punishment, because the dog didn’t get what she wanted. If the dog, for example, starts to run to fetch an object that we have just thrown away, but we had in mind that the dog should sit by our side until we asked her to run off, we (or an assistant) simply take the object – and the dog missed out on all the fun. We never correct the dog’s behavior in any way that the dog may perceive as unpleasant, neither physical nor verbal. We also focus on the fact that the dog should be engaged in the training because then it is more enjoyable both for the dog and for us – and the dog learns a lot better that way than if we try to force her to do something. We often call it offered behavour – that the dog does something not because she is forced, but instead because she will get something that she wants. We also try to use as few aids as possible, to avoid having to get rid of them later. The name clicker training suggests that the clicker, the small plastic box with a little metal plate that says “click” when we press it, is very important, but that is not necessarily the case. The clicker can be great to use when the dog should learn a new behavior because the dog then learns very quickly because it is so easy to mark the correct behavior. We need to somehow tell the dog that she has done the right thing and that she will soon get her reward and that we can do with the clicker, a certain word, a gesture, or as the dolphin trainers do – with a whistle (in the gun dog training we use a whistle instead of a clicker). In other words, when you use clicker training you need to do a lot of planning, thinking, and evaluation of the training. We can’t do it too fast – instead we build up the training in small steps so that the dog gets a chance to learn what we want her to learn. If it doesn’t work, we have made the training too difficult for the dog and we have to modify the training – make it easier for the dog so that she will succeed. Another good thing about clicker training is that we can use it when we train our puppy. It is probably during that time that the clicker training is best because puppies do so many things that are correct and they test everything without any inhibitions. As we constantly adapt the training to the puppy and only train a couple of minutes at a time, it never gets too difficult or too demanding, and even a little puppy brain can learn a lot of good things.